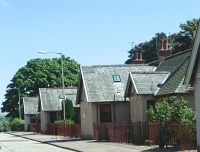 Honeyman, Keppie & Mackintosh built a row of eight single-storey, semi-detached roughcast cottages for workers at J. Pullar & Sons' dye works at Tulloch, Perth, and two two-storey blocks containing a total of ten flats. Status: 8 cottages remain standing; 10 flats demolished. 1: Perth & Kinross Council Archive: Record book of work at workers' housing, 1902, unpaginated, MS51/1/239.